Holidaymakers were left fearing the worst when their cruise ship, that was operated by the same company involved in the Costa Concordia tragedy, was left stranded when a fire broke out. The Costa Allegra was carrying 636 passengers - 31 British and one Irish - when a fire started in the generator room and the ship lost power leaving it drifting in the Indian Ocean. The vessel, owned by Costa Cruises, was around 200 miles from the south-west of the Seychelles when the incident occurred. Captain Giorgio Moretti said the power cut knocked off the lights and air conditioning but generators kept the command room lit and in radio contact. 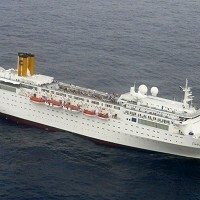 Passengers were kept in a large communal area of the ship whilst night fell and darkness took hold. Rescue boats eventually arrived and were able to start to tow the ship to the nearest port after it was left to battle 5ft waves. Passengers will be thankful to reach dry land after their ordeal and will be able to claim expenses for their trip being cut short through their cruise travel insurance .